Studio Line: Universal Studios - You better watch out! In this live-action adaptation of the famous Christmas tale by Dr. Seuss, director Ron Howard, casts comedian Jim Carrey in the title role, giving this rendition of How the Grinch Stole Christmas a perverse, manic spin. Add great special effects and a fast-moving script and this well-loved story of a freakish green monster living in a mountainside cave who disguises himself as Santa Claus, and steals the Christmas goodies from every single home in Whoville, becomes a hilarious holiday comedy. Awards: Won for Best Makeup. Nominated for Best Art Direction-Set Decoration; Best Costume Design. Box Office: Budget: $123 million. Opening Weekend: $55.082 million (3127 screens). Domestic Gross: $260.031 million. DVD: Widescreen 1.85:1/16X9; audio English Dolby Digital 5.1 & DTS 5.1, French Dolby Digital 5.1, English DVS Dolby Surround 2.0; subtitles English; closed-captioned; single sided - dual layered; 20 chapters; rated PG; 105 min. ; $26.98; street date 11/20/01. Supplements: Spotlight On Location; Deleted Scenes; Outtakes; Who School; Makeup Application and Design; Seussian Set Decoration; Visual Effects; Faith Hill “Where Are You Christmas?” Music Video; Wholiday Recipes; By the Numbers; Theatrical Trailer; The Grinch’s Special Offer; Production Notes; Cast and Filmmakers; Grinch Game Demo; Two Sing-Along Songs; Read-Along; Dress the Grinch; Rhyme Time; DVD-ROM Features. Before it hit movie screens, I never could decide if the 2000 live-action version of Dr. Seuss’ How the Grinch Stole Christmas sounded like a disastrous idea or if it was money in the bank. On one hand, the movie would tamper with an acknowledged holiday classic, the original animated TV edition from the Sixties. Remakes usually work best when they take on somewhat-forgotten properties, but since millions of folks grew up on yearly viewings of The Grinch, the film would enter dangerous territory. On the other hand, those millions of people opened up a ready-made audience who felt familiar with and fond of the material. In addition, many of those who watched it as children have grown up and produced kids of their own; since the TV version first hit the airwaves in 1966, that meant lots of little ones who emerged in the years hence. As such, a new take on The Grinch would encounter an audience of folks and their progeny with positive attitudes toward it, especially since it seemed like a flick that could be enjoyed by the whole family. Add to that two other factors. For one, The Grinch attracted Ron Howard, a very successful director over the years; with movies like Apollo 13, Howard has shown that he can produce family-friendly fare that takes existing subject matter and maintains a high level of entertainment. In addition, The Grinch would star Jim Carrey in the title role. The cartooniest actor in existence, Carrey felt highly appropriate for this part, and his casting lent a strong level of credibility and star power to the project. Despite my doubts, the second half of this equation dominated. The Grinch emerged as a serious hit during the 2000 holiday season, as it eventually took in $260 million and grabbed the spot as the top-grossing movie of the year; it also currently stands as the 14th biggest money-maker of all-time. Apparently no one was upset with the new direction taken by the classic. I intended to check out The Grinch during its theatrical run, but I never got around to it, so the DVD would be the first time I’d see it. Although I like the animated version of the story, I don’t feel any great attachment to it or defensiveness about it, so I figured I’d not be bothered by any liberties taken. After all, the movie runs roughly four times as long as the TV show, so clearly they’d need to open up the story to a great extent. That they did, and the result is something of a disaster. I definitely didn’t like The Grinch, though my disaffection has less to do with the padding added to the tale than with the crude alterations in tone and spirit. The film version of The Grinch takes a warm and witty holiday tale and makes it an obnoxious and grating piece of noise. In a nutshell, here’s the plot: at the start of the film, we meet the denizens of Whoville, a burg that apparently exists inside of a snowflake. The Whos adore Christmas, and they obsess about it virtually all year long, so when the date finally approaches, the folks enter a state of mania. However, all’s not perfect in Whoville, as little Cindy Lou Who (Taylor Momsen) seems to have lost that Christmas spirit. Her mailman dad Lou Lou Who (Bill Irwin) appears sympathetic but confused, and her mom Betty Lou (Molly Shannon) cares too much about producing the most garishly decorated house in the neighborhood to take much notice of this concern. Betty appears particularly fixated on topping the display mounted by snooty neighbor Martha May Whovier (Christine Baranski). Lurking in the background in his mountaintop cave is the Grinch (Carrey), a bizarre furry green dude who loathes the Whos and Christmas with equal passion. He exists as something of a town bogeyman, and folks are terrified to even approach his territory. After a brief encounter with the Grinch, Cindy starts to wonder about him, and she interviews townsfolk to learn more about his past. At that point we see a flashback to his childhood and find out why the Grinch seems so nasty. We also get some back story about Martha May and town mayor May Who (Jeffrey Tambor). Cindy makes it her mission to reintegrate the Grinch into Who-ciety, so she campaigns to get the people to choose him as the “chairman of cheer” at their “Whobilation”. To the dismay of the mayor, she succeeds, and eventually she convinces the Grinch to come to the big celebration. Inevitably, things go awry - mainly due to the mayor’s obnoxiousness - and the Grinch becomes more bitter than ever. As such, he determines to ruin Christmas for the Whos, and he steals all of their presents and holiday doodads. This is the point at which the movie really links to the TV show. Until the Grinch decides to steal Christmas, the film is on its own, but the final act much more closely hews to the plotting of the original. Of course, it still takes some liberties, but I’ll leave those unspecified so that I omit any potential spoilers. The ending stays in the same ballpark as the TV program, though, so don’t expect any radical differences. However, much about the movie version of The Grinch did seem very different from the TV show. Probably the most significant alteration occurred due to the tone of the lead character himself. In the TV program, the Grinch appears as a nasty piece of work with no back story. He hates everything and everybody, and that’s that; we don’t bother with much context. The movie, however, attempts to give us a psychological background for the character, as we learn how he came to be so bitter. It significantly harms the product. In the TV show, the Grinch’s change of heart comes across as a big revelation and it supports the “true meaning of Christmas”. Here, we feel sorry for the Grinch well before this happens, and that undercurrent makes the overall result less compelling. The background almost makes the Grinch a victim, and it’s much harder to take him seriously as a vicious ogre when we’ve seen his soft side. Sure, it creates a more well rounded character, but a cartoon story like this doesn’t need that kind of depth, and the extra dimension feels awkward and useless. On the surface, Carrey seems like the perfect choice to play such a broad character. After all, he shows a cartoony personality in much of his comedic work; who better to portray this sort of role? Unfortunately, Carrey’s hammy tendencies get the best of him, and he comes across as more over the top than usual, but without much charm. A lot of the problem stems from Carrey’s particular talents. He’s a grand physical comedian, and his expressive face brings much to the table. Unfortunately, the Grinch costume buries Carrey under layers of makeup and prosthetics, and the actor’s skills rarely emerge. If anything, he tries harder than usual to make a physical impression, and these attempts come across as quite overbearing at times. Carrey’s shtick can be very effective, as during flicks like Liar Liar and The Mask - which also placed Carrey under heavy makeup - but he goes so far to make himself heard in The Grinch that any form of genuine personality fails to appear. I’ve come to like Carrey over the years, but his work in The Grinch did little more than get on my nerves. The remaining actors fared little better, though it’s hard to imagine how endearing they could become since they’re also submerged under creepy makeup. Boy, does that “Who” look seem unappealing! Granted, it was an interesting touch to make the performers more closely resemble their animated predecessors, but the results seem very off-putting; it’s hard to look at them without constantly thinking about the ugly makeup. The Grinch features some good performers in supporting roles, but the movie’s really all about Carrey, so they get little to do for the most part. Irwin seems excessively bland as Lou; he fails to make any impression. Ironically, Baranski looks better than ever as Martha May. Personally, I think she got the part because she already resembled a Who, but whatever the case, she appears more attractive than normal. Unfortunately, she’s unable to add any spark or personality to her role. Tambor comes across like nothing more than a bland baddie, and his character feels more out of place than the others. Actually, he only appears odd in the context of the original program; unfortunately, he fits in all too well in the “new” Whoville. In the TV show, the Whos were uniformly kind and pleasant. Initially the Grinch thought that they were cold and materialistic and that he could subvert their holiday celebration simply through the elimination of its tangible assets. He grew as a person only when he learned that the Whos really didn’t care about all of that, and they were more concerned with the spiritual meaning of the day. These Whos get to the same point, but it seems much less palatable, largely because of characters like the mayor. Granted, he takes the negativity and self-obsession to an extreme, but most of the Whos come across as being stuck on the holiday doodads. They’re showy and obsessed with superficial things, and unlike the animated Whos, they appear plenty ticked off when the Grinch steals Christmas. Of course, the movie tries to bring about an ending that resembles the one in the TV show, but it feels forced and artificial. The Grinch embraces all of the things that the original tried to negate. It’s cold, crass and crude, and it feels like it exists just to move merchandise. Any attempts to support the “true meaning of Christmas” come across as patronizing and tepid. The Grinch wants to have it both ways, but it can’t, and only the obnoxious, showy side wins. As the only Who who tries to plumb the depths of the holiday, Cindy seems just as fake. It doesn’t help that Momsen is a child actress straight out of a catalog. She appears to exist simply to push the plot. In the original, Cindy made only a brief appearance when the Grinch broke into her house. Here she’s turned into a leading character, and the expansion creates its own problems, a lot of which revolve around the bland and saccharine performance by little Momsen. She looks cute but nothing more, and she adds no spark or personality to this pivotal personality. Cindy feels like padding, as does much of the movie. Like I mentioned earlier, the movie lasts more than four times as long as the TV show, and it needs to bring a lot of extra material to the table. Unfortunately, all of this footage feels like the filler that it is. The film tries to expand the tale but it doesn’t offer anything interesting. Overall, the scenes come across as persistent repetitions on the same themes, as we watch endless shots of Carrey’s vamping and goofiness. The Grinch also suffers from the snide attitude that pervades many modern films. Rather than actually attempt genuine emotion and feeling, The Grinch goes with a satirical presentation much of the time. It wants desperately to be wicked and pointed, but it consistently falls flat. The characters break the “fourth wall” on many occasions, and lots of other self-referential material appears. It all seems forced and gratuitous. As does The Grinch itself. I went into the film with a reasonably positive outlook; I didn’t expect to be bowled over by the movie, but I thought it’d be an entertaining and witty experience. Unfortunately, the flick is nothing more than a crass and pointless exercise that left me actively disenchanted. How such a strong roster of participants could produce such an unpleasant and witless enterprise seems unfathomable. Footnote: I have to note that my negative assessment of The Grinch was shared by one of my dogs. Whenever the Grinch himself appeared on screen, Biscuits started to yap and growl at the screen. Good judgment, puppy! Dr. Seuss’ How the Grinch Stole Christmas appears in an aspect ratio of 1.85:1 on this single-sided, double-layered DVD; the image has been enhanced for 16X9 televisions. This disc provided my second viewing of The Grinch after I first watched the surprisingly bland fullscreen version. As such, I was afraid the widescreen edition would suffer from some of the same problems, but happily, it offered a much strong picture. Sharpness looked consistently crisp and accurate. The movie used a mildly gauzy look to enhance the fantasy aspects of the tale, but this didn’t seem nearly as intrusive as it did during the fullscreen version. On that disc, the image took on a distinctly fuzzy look, but that wasn’t a concern here, as the movie remained nicely detailed and distinct at all times. Moiré effects and jagged edges still caused no problems, and I saw no signs of edge enhancement. In regard to print flaws, I witnessed a couple of specks of black grit, but otherwise the movie looked clean and fresh. Black levels seemed to be deep and rich, and contrast was good. Shadow detail came across quite well, as low-light situations displayed appropriately opaque but not excessively dark visuals. The blacks seemed darker on this disc than on the fullscreen one, and that made the contrast and shadows more effective here. The Grinch featured a fantastically cartoony and varied palette, but the fullscreen DVD did not show these hues to their best advantage. Thankfully, the widescreen one displayed them in a much more satisfying manner. They still weren’t eye-popping, but that was mainly due to the apparently intentional slightly gauzy look. Nonetheless, the hues came across as more vibrant and vivid than on the other DVD, and they helped make this a very solid transfer that strongly outdid the fullscreen one. Like a number of Universal DVDs, The Grinch includes both Dolby Digital 5.1 and DTS 5.1 mixes. Much of the time I find the two to sound virtually identical, and when I do give an edge to the DTS track, it normally is minor. However, this case was different, as I thought the DTS version provided a significantly stronger auditory experience. I’ll discuss my impressions of the DTS edition first and then relate the ways in which the Dolby track differed. The soundfield to The Grinch often stayed with a distinct forward emphasis. Within the front spectrum, the elements seemed to be accurately delineated and clearly placed, and they moved between channels well. Panning was smooth and clean, and the effects blended together well. The score demonstrated good stereo imaging, and some dialogue appeared from the sides as well, though most of the lines remained anchored in the center. As far as surround usage went, much of the time the track stayed with general reinforcement of the music and effects. However, this improved on a number of significant occasions, and when appropriate, the rears added some solid information to the mix. Probably the showiest scene in the film took place when Martha May used her Christmas light gun to decorate her house; the rat-a-tat of the tool fired all around as the bulbs flew into place and the track provided some excellent use of the split surrounds. It was a very cool moment, and some additional positive elements arose, especially during the movie’s climax. The level of involvement remained relatively light for the most part, but the soundfield of The Grinch worked well for the most part. Audio quality appeared to be fairly solid. Some louder dialogue displayed minor edginess, but overall the speech sounded natural and distinct, and I detected no problems related to intelligibility, though Carrey’s Grinch-voice made some lines tough to comprehend. Music showed good brightness and depth at all times. I thought the score could have demonstrated somewhat stronger dynamics, but overall it seemed clear and reasonably vibrant. Effects also displayed a reasonable punch when appropriate. Those elements always sounded clean and accurate, and they showed good low-end response at times. The roar of the Grinch’s vehicle packed a fine punch, and a number of other pieces also showed nicely rich and warm tones. Overall, the mix was a little too subdued to merit “A”-grade consideration, but I thought the DTS version of The Grinch sounded good as a whole. As for the Dolby Digital mix, it seemed distinctly less satisfying. Although the DTS soundfield wasn’t remarkable, the DD one appeared even less broad and engaging. The activity level stayed more passive, and it never came across with similarly vibrant tones. It was a big difference in ambience levels for the most part. When I checked out the DTS version, I heard a fair amount of little elements from all around, though they stayed mainly in the front speakers. The DD edition came across as less lively and more sterile; the atmospheric pieces largely lay dormant and unnoticed when I listened to that track. The audio quality also dipped with the Dolby mix. As a whole, the track felt somewhat sterile and flat, and it lacked the same nice level of depth heard in the DTS version. Bass response seemed to be quite weak for the most part during the Dolby track, and the entire presentation failed to deliver much presence. The edginess heard in the speech seemed more prominent and noticeable during the Dolby mix as well. Overall, the Dolby version remained acceptably clear and listenable, but it was a somewhat drab and bland presentation, especially when compared to the greater vivacity heard during the DTS track. As such, the Dolby mix merited a “B-“ while the DTS one earned a “B+”. Universal have issued The Grinch as a part of their Collector’s Edition line, and it includes a mix of supplements. Three different versions of The Grinch appear on DVD. My discussion will initially cover the elements that exist on all of them, and I’ll provide a description of the differences at the end. First we find a brief Spotlight On Location featurette. Most of these run around 15 to 20 minutes, but the program about The Grinch only lasts seven minutes and 15 seconds. Despite its brevity, “Spotlight” actually packs a reasonable amount of information. The piece quickly covers most facets of the production, from its origin to casting and various visual elements. We see the usual mix of movie clips, interviews with participants, and shots from the set. Ultimately, the program remains largely promotional, and it’s far too short to give us a very good look at the film, but it seems surprisingly satisfying nonetheless. Next we discover a section of Deleted Scenes. Each of these goes between 45 seconds and three minutes, 35 seconds for a total of nine minutes and 21 seconds worth of material. As a whole, these were minor excisions. The longest one showed additional antics of the Grinch as he caused havoc in Whoville, while others offered items like a little more of his Christmas night heist. Fans of the film will be happy to see them, but they didn’t include anything terribly substantial. What would a Jim Carrey DVD be without Outtakes? Uh, still a Jim Carrey DVD, but nonetheless, his wild style of improvisational comedy leads to plenty of fun moments on the set. I often don’t like outtakes since they tend to fall into the “actor messes up and giggles” realm, but Carrey’s antics usually seem fun. The DVD includes three minutes and 13 seconds of these. Compared to fare like the clips seen on Liar Liar, there are somewhat drab, but they’re not bad for what they are. A mix of additional featurettes cover a variety of different topics, and they’re good enough they almost let me forgive the lack of an audio commentary. Who School lasts for five minutes and 42 seconds. It focuses on the unusual movements demonstrated by the Whos as we hear from stunt coordinator Charles Croughwell, director Ron Howard, producer Todd Hallowell, and actors Bill Irwin and Molly Shannon. We also see lots of shots of the performers who brought the many nameless Whos to life. The program features a lot of good shots from the set as we watch rehearsals and training, and it’s a very interesting piece. Makeup Application and Design runs for six minutes and 56 seconds as it discusses those topics. The show covers issues related to both the Grinch and the Whos; the latter sticks mainly with design topics; they wanted to make the characters Seuss-esque but not grotesque (I don’t think they succeeded). We also learn a lot about the techniques and procedures used for Carrey’s makeup. We hear from makeup designer Rick Baker, Ron Howard, producer Brian Grazer and makeup artist Katsuhiro Tsuji and we see a lot of good material; from early makeup tests and sketches to Baker’s trial run that used the Grinch gear on himself, the show provides a lot of interesting footage and it neatly goes over the subject. Seussian Set Design takes five minutes and 14 seconds as it relates concepts about this area. Again, the challenge was to keep things in the Seuss spirit, and we hear from production designer Michael Corenblith, Ron Howard, set decorator Meredith Boswell, property master Emily Ferry and Seuss widow Audrey Geisel as they discuss the challenges and their efforts. In addition, we watch various shots from the set and preparatory sketches. As with its predecessors, this is another breezy and informative little piece. Visual Effects runs 10 minutes and 48 seconds. This program’s drier than the others, but it still adds a lot of useful information. We hear solely from visual effects supervisor Kevin Mack as he narrates images of the different computer-generated material. We see how much of the film used CGI and Mack ably tells us how these effects were done. My favorite instance offers a split-screen comparison of a mountaintop shot of the Grinch. Overall, the program helps to give us worthwhile knowledge about this subject. In addition to the film’s theatrical trailer, we get a music video for Faith Hill’s performance of “Where Are You Christmas?” The latter follows the traditional format, as Hill and her ridiculously crimped hair lip-synch the song in front of some movie sets. This is intercut with many shots from the flick itself, and little Taylor Momsen offers a cameo. Cripes, the amount of makeup on that kid makes her look like she’s 47-years-old! I get spooky JonBenet vibes when I see this tot. 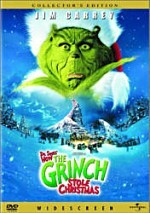 “Recommendations” simply lists a number of other Universal DVDs the studio thinks Grinch fans might like; often these areas include trailers, but none appeared here. “The Grinch Game Trailer” simply shows a minute of what looks like a pretty lame videogame in the Mario vein. As I’ll discuss in the appropriate area, a demo for this game also appears in the DVD-ROM department. In addition, “The Grinch’s Special Offer” offered a 90-second promo for all of the studio’s amusement parks. Despite the title, there was no “special offer” involved; the glossy ad ended with a number to call to book a vacation, but unless it’s a special line through which one can get a bargain, I saw nothing “special” about the piece. A totally separate domain on the DVD adds materials meant for kids. In “Max’s Playhouse”, we find two subtopics: “Fun & Games” and “Music Time”. In the former, we start with “How Do I Find Things?” This piece shows kids how to navigate a DVD and locate various goodies. This seems like a considerate extra, though it feels odd; if the kids can’t work their way through a DVD, how did they get here? “Rhyme Time” has kids pit the appropriate rhyming words into one of four brief texts; the rewards are narrated version of those pieces. If you complete all of them, you get a 10-second congratulatory snippet from the movie. Lastly, “Dress the Grinch” lets you see him in any of eight different costumes such as “cowboy” and “fireman”. “Music Time” repeats the Faith Hill “Where Are You Christmas?” video seen elsewhere on the disc. It also includes two “Sing-along Songs”. We can croon with “Where Are You Christmas?” (the Cindy Lou version) and “You’re a Mean One, Mr. Grinch”. Some DVD-ROM materials round out the set, most of which pop up in smaller subdomains. As you browse through these, “Who knew?” trivia facts run at the bottom of the screen. In the “Cindy Lou Who’s House” area, we find a Grinch custom Internet browser, a Grinch screensaver, and four “Grinch recipes” for items like “designer onion wreaths”; three of these appeared in the recipe section of the main DVD, but the DVD-ROM domain tosses in a bonus recipe. When we go to the “Post Office”, we get “sound snippets”, which offers seven different Grinch quotes, as well as a “Grinch screenmate”, a program that will plop a little Grinch to scamper about your monitor. Lastly, the “Post Office” lets you install a demo version of the “Grinch” computer game mentioned earlier. I gave it a quick run-through and wasn’t impressed with what I saw. It did appear to be a Mario style game with a Grinch theme, but it didn’t seem to offer much of interest. The “Theater” simply offers some of the same featurettes found in the main DVD; this area includes nothing not observed there except for an offer to try MSN Explorer. “Mt. Crumpit” provides 10 different items under “Production Notes” - which mainly differ from those found on the main area of the disc - while “Who Pics” includes 10 publicity photos that can be slightly enlarged from their thumbnails and also utilized as wallpaper. “Cast and Crew” gives us listings for eight actors as well as director Ron Howard and producer Brian Grazer; they were the same nine found on the main part of the DVD plus actor Clint Howard, but the DVD-ROM area provides more detailed information. Finally, the DVD-ROM area provides some Internet links. We get connections to: Universal DVD Newsletter; Universal DVD; Universal Home Video; Universal Pictures; and Universal Studios. We also find the ubiquitous link to sign up for Universal’s DVD newsletter. One very cool aspect of this DVD: it provides a DVS (Descriptive Video Service) audio track for the visually impaired. These have appeared on a few DVDs such as Disney’s Tarzan, but they remain pretty rare. Universal really went all out with this one, however. Not only did it provide a narrated description of the movie’s action, but it also covered most of the supplements and menus as well! With the DVS activated, a visually impaired person can navigate the entire disc independently, and descriptions showed up for the various extras. Since most of the bonus materials also include English and French subtitles, The Grinch provides the most user-accessible DVD I’ve ever seen. Congratulations to Universal for working so hard to offer a DVD that a wide variety of people can enjoy. The comments above cover the extras found on all DVD versions of The Grinch. Three different editions exist. The DVD discussed here appears as one of two standard Collector’s Editions; the other is identical except it offers a fullscreen presentation of the movie. In addition, this fullscreen disc can be found in a “DVD Interactive Play Set” rendition reviewed here; the only difference comes from the packaging. Personally, I don’t want to own any version of Dr. Seuss’ How the Grinch Stole Christmas. I found this film to offer a startlingly crass and unfunny experience that rarely offered any entertainment or charm. The widescreen DVD provides solid visuals, and while the Dolby Digital soundtrack seems somewhat thin and lifeless; at least the DTS mix features much stronger audio. Lastly, the DVD includes a slew of extras, but none of these seem terribly substantial; it lacks a nice documentary or an audio commentary. If you liked The Grinch and want to own a copy, I’d strongly steer you toward this widescreen edition. It duplicated the sound and extras of this one, but its picture seemed substantially superior. Diehard haters of “those black bars” may still want that fullscreen version, but I feel it’s definitely the weaker product. The widescreen DVD offers the best rendition of the film.